Materials needed prior to starting: warm wet sponge, wash cloth or paper towel, possible baby powder for Step 5. While you are applying your IC Pro™ Temporary Safety ID Tattoo, talk to your child about their safety if they are separated from their family or group. Always make the child aware of where you are placing the tattoo. That way they can direct an authority figure to where the information is. 1. Be sure your child's skin is clean and dry before you apply the temporary safety ID tattoo. Please make sure your child's skin does not have any oils such as sunscreen or lotion on it before applying IC Protection’s™ Temporary Safety ID Tattoo. Avoid using sunscreen on or near your Tattoo, as most brands will break down the adhesive in IC Protection’s™ Temporary Safety ID Tattoo. 2. Choosing a location: You can either have the Tattoo visible or non-visible. If you do not want to have your cell phone number visible for privacy issues than the non-visible location would be better suited for you. Choose a place to apply the tattoo on his or her body that doesn’t have a lot of hair. Remember, especially when placing the IC Protection’s™ Temporary Safety ID Tattoo in a non-visible location, to remind the child to remember the location in case of him or her getting lost. 3. Carefully peel the clear transfer sheet away from the colored side of the IC Protection’s™ Temporary Safety ID Tattoo (your finger nail works best). Once the clear sheet is pulled apart from the colored sheet (the adhesive side is facing up) carefully hold the paper on the edges and do not touch the flat surface. 4. With dry hands, apply the adhesive/colored side towards the child’s skin and press and hold firmly in place on your child's body area for 20 seconds so the adhesive on the tattoo can bond to his or her skin. 5. Use a warm wet sponge, washcloth or paper towel to thoroughly wet the back of the temporary tattoo. As the water soaks in, the tattoo paper will become soaked. Use lots of water for best results. Within about 30 seconds, the paper will soon easily slip from your child's temporary tattoo. Let the tattoo dry thoroughly. This can take several minutes. 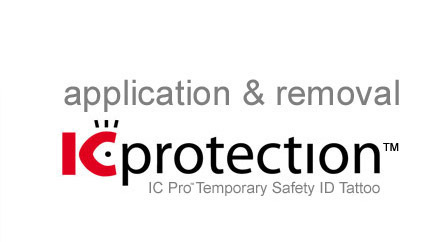 Please be sure your IC Protection’s™ Temporary Safety ID Tattoo is dry before covering with clothing or any material. If your tattoo still seems sticky after a few minutes, that is just residual adhesive from the protective paper. Enclosed with every order is a package of baby powder. Take a small amount of baby powder on your fingers or sprinkle and gently rub across the IC Protection’s™ Temporary Safety ID Tattoo. This will remove any of the tackiness and quicken the drying time. Gently wipe or blow away excess baby powder. This may be required one or more times during the use of each Tattoo. In cases of extreme water exposure to the IC Protection’s™ Temporary Safety ID Tattoo, one or more applications of baby powder may be required. This will no way harm the product and we do suggest keeping any remaining baby powder until at such time that the tattoo is of no more service. You can remove your child's temporary tattoo with baby oil, suntan lotion (oil based) or rubbing alcohol. Be sure to wash the area with soap and water before you try again. Your IC Protection’s™ Temporary Safety ID Tattoo can last from one to several days. If you have sensitive skin and have received a rash from band-aids or adhesives you may want to leave your tattoo on for only a few hours. You can shower with your tattoo, but do not scrub-just rinse lightly to keep clean. 1. Do not apply to sensitive skin or near eyes. 2. Always be cautious and do a small test area with your tattoos prior to applying for long durations. 3. As a precaution, do not use this temporary tattoo (or any other adhesive products) if you are pregnant or nursing.